Reversi is a board game played by two players (You against the Computer) on a board with 8 rows and 8 columns and a set of distinct pieces for each side. 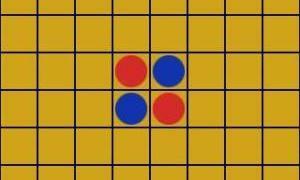 Pieces are disks colored in red and blue, each side belonging to one player. The player's goal is to have a majority of their colored pieces showing at the end of the game, turning over as many of their opponent's pieces as possible.